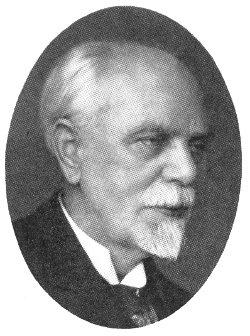 Raunkiaer, who worked with and for the great plant ecologist Eugenius Warming for many years in Copenhagen (eventually replacing him), is known as the creator of the most successful plant life-forms classification system. A man who was highly statistically inclined, Raunkiaer began to develop his system in the early 1890s while he was immersed in studies on the Danish flora. In his systemization plants are grouped according to the physical position and degree of protection of their perennating buds (meristems); on the basis of such measurements on a thousand species worldwide Raunkiaer was able to argue that four basic "phytoclimates" existed: the hot, humid tropics, arid regions, high latitude and altitude areas, and the moderately humid temperate zones. Raunkiaer published a good deal of work on the Danish flora, and on the floras of places he had visited outside Denmark. --born in Raunkiaer (a large farm), West Jutland, Denmark, on 29 March 1860. --dies on 11 March 1938. --McGraw-Hill Encyclopedia of Science & Technology, 9th Ed., Vol. 13 (2002): 750-751. --Taxonomic Literature, Vol. 4 (1983). --Proceedings of the Linnean Society, Vol. 151 (1941): 248-251. --Journal of Vegetation Science, Vol. 1(1) (1990): 41-48. --Bulletin of the Torrey Botanical Club, Vol. 108(4) (1981): 472-478. --Botanical Review, Vol. 16(1) (1950): 1-32.